In the wake of the death of Eric Garner and Michael Brown at the hands of white police officers with no indictment, I am looking for hope somewhere. After learning of the verdict in New York yesterday morning, there is a very sad heaviness for the United States. We have yet another death of a black mother’s son. For me, I am trying to remember Ella Baker and reflect on how much work we still have do around issues of racial equity and equality. Baker was one of the most influential players in the civil rights movement. Baker’s grandparents were slaves and she would hear stories from her grandmother about slave revolts. After finishing college and graduating valedictorian, she moved to New York and started her life’s path of social justice. Baker fought for civil rights alongside others such as, W.E.B. Du Bois, Thurgood Marshall, and Dr. Martin Luther King. She was also a mentor to our Rosa Parks. Baker’s influence touched the NAACP, the Southern Christian Leadership Conference (SCLC), and the Student Nonviolent Coordinating Committee (SNCC). Baker and another hero of my mine, Howard Zinn, were two of the SNCC’s highly revered adult advisors. 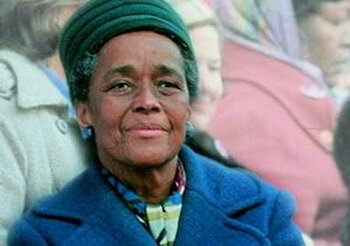 Baker remained an activist until her death in 1986. Thank you, Ella. Thank you Sweet Honey in the Rock!